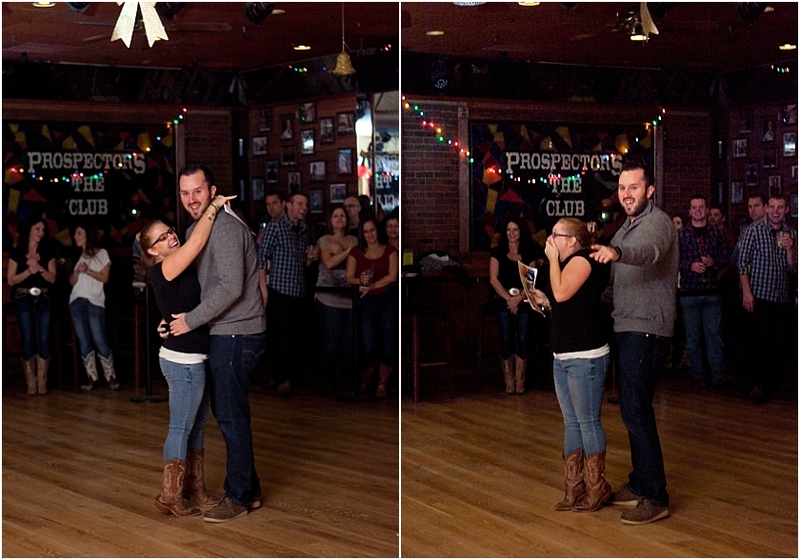 I absolutely love shooting proposals. The excitement, the planning, the challenge of not being spotted, its all so much fun and it ends with one very happy couple! I loved helping Luke plan out how he was going to ask Kacie to marry him and it was an added bonus it was happening at one of my favorite places, Prospector’s Steakhouse and Saloon..
As we stood out in the rain with all of Kacie’s friends and family, huddled together under the side of the neighboring Walgreen’s awning, you could feel the excitement and nervousness radiating off Luke. Kacie was just inside the bar spending the evening line dancing with her mom. She had no idea what was about to happen! While she was busy we all snuck into the bar and stood on the opposite side of the room. Thankfully it was busy and she wasn’t expecting us so she didn’t even notice. Earlier in the night her mom had told her that she had entered them into a sweepstakes for a cruise so Kacie thought she had won when she was called out onto the dance floor. Instead Luke walked out and dropped down on one knee! This is when Luke pointed out all of us to Kacie!